"Trimble has been providing location-based services for the mobile workforce for 30 years, and PULSE links the mobile workforce with the office to deliver operational improvements and enable IoT-connected workflows," said John Cameron, general manager of Trimble's Field Service Management Division. "Trimble has been providing location-based services for the mobile workforce for 30 years, and PULSE links the mobile workforce with the office to deliver operational improvements and enable IoT-connected workflows," said John Cameron, general manager of Trimble's Field Service Management Division. "The number of connected assets is expected to grow dramatically in the next few years, and PULSE Telematics is well positioned to scale and meet this demand." 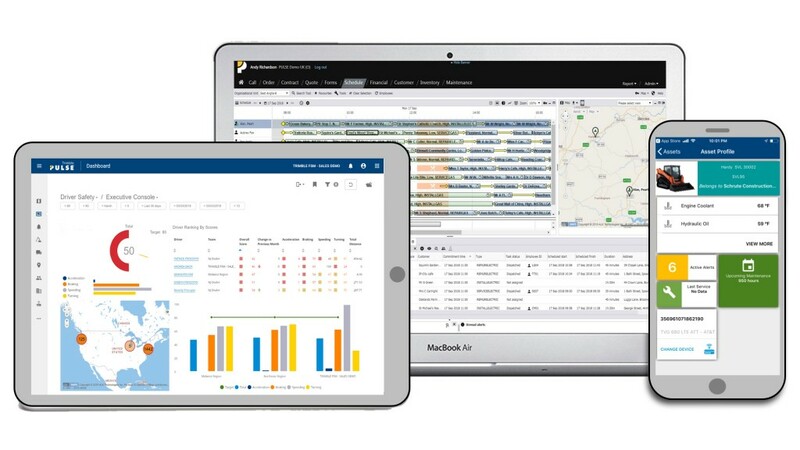 SaaS-based and modular, Trimble PULSE with telematics empowers businesses across a range of industries, including construction, agriculture, telecommunications and utilities, to share real-time information, perform usage and utilization analysis, and monitor performance, safety and compliance of their assets and drivers. "We worked closely with leading customers in the construction and agriculture industries to develop PULSE Telematics," said Brant Carter, director of strategic marketing of Trimble's Field Service Management Division. "One customer using insights from PULSE achieved a 28 percent reduction in idle time and an 18 percent decrease in fuel consumption over a 12-month period. Our current and future customers will appreciate the improvements in productivity and cost savings that PULSE can deliver."